Kevin Rudd spoke on the world's growing interest in China's plans at the Seventh World Forum on China Studies in Shanghai. "The world now has a natural interest in understanding what China is doing as it affects directly, practically every country in the world," said former Australian Prime Minister Kevin Rudd. 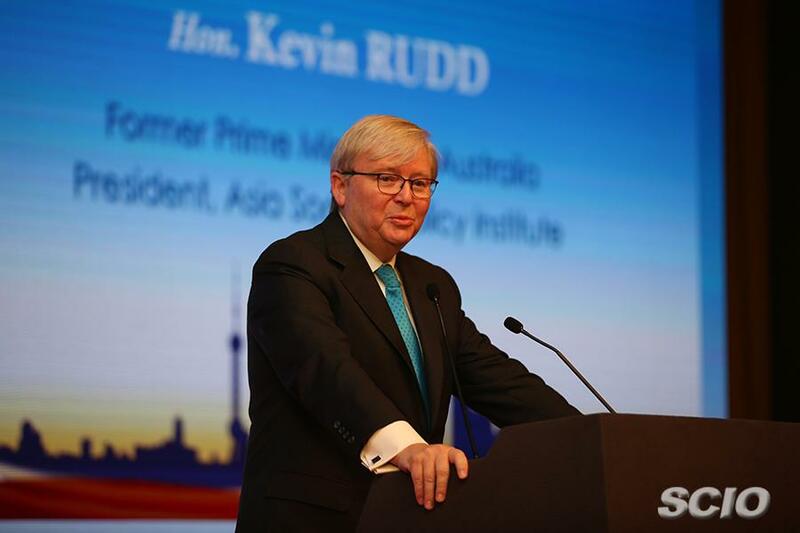 Rudd made the remark on Sunday in Shanghai at the Seventh World Forum on China Studies. The world's interest for China comes with the country's rise as a global power in recent decades, Rudd said. He noted that China ranks higher than the U.S. in terms of its GDP based on purchasing power parity (PPP). "The international community wants to know China's future plans, new concepts of its foreign policy, as well as the meanings attached and the concrete policies associated, and how the country's economic and financial reform are going forward," Rudd said. For this purpose, over 180 sinologists from 30 countries and regions arrived in Shanghai to attend the forum and learn about the newly unveiled Xi Jinping Thought on Socialism with Chinese Characteristics for a New Era. Xi's thought includes 14 fundamental principles, ranging from ensuring the Communist Party of China's leadership to the building of a community with a shared future for mankind. "In the past, China's leadership may regard many things as matters for internal Chinese affairs, while in this new era, there will be new expectations from the world to understand as much as possible of what China's doing," Rudd said. Speaking in fluent Mandarin, Rudd called for the scholars in the field to analyze and explain Chinese ideas and concepts, properly synthesize available information, and try to forge common interest and common values in cross-cultural and inter-civilization communication. Speaking to a group of sinologists, he gave his personal account in witnessing China's "incredible transformation" from an impoverished country into a global super power. "The reasons behind China's success lie in the country and its people's perseverance and strategic patience in overcoming difficulties, as well as the vision in the country's leadership in breaking new grounds," he said.